I’ve read a couple of the books in the Cotton Malone series and really really enjoyed them. 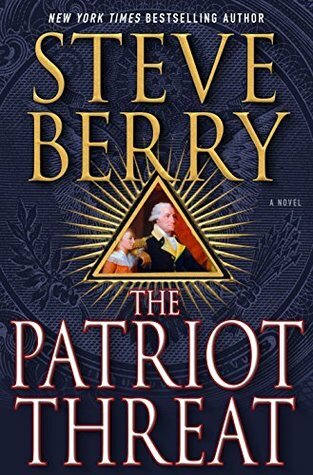 Steve Berry has a special talent for merging politics, history, and conspiracy all together so well. This time, our favorite ‘retired’ agent is recruited by his former boss to find a North Korean who has some top secret Treasury files. Basically his novel begs the question “what if federal taxes were actually illegal”. This case is anything but straight forward for Cotton and he finds himself globe trotting, trying to chase down leads and to recover the documents, not to mention wading through convoluted history. The reader is treated to an array of historic facts (and some speculations), exotic locations, a new love interest for Cotton, and enough red herrings that keep the reader guessing until the end. This series has been a little hit and miss for me. In the two other books I’ve read by him previously, I didn’t get the sense that Berry’s personal political opinions were creeping into the story…..but with this one I sort of did. Normally I would be put off by that but it wasn’t overly distracting but it was enough that I noticed. With other books I felt like things moved nicely and weren’t dull, however in this book, I did see a few plot lines that could have been pared down or cut all together. I don’t know if it was because this one was based on taxes and economy but for some reason this book didn’t clip along like the others. The beginning was promising though. There was a lot of action and reminded me of a James Bond film so that was exciting and engaging but some of the other subject matter was a little bland. One thing that I will give Berry the most credit for in his writing and novels….he does his research! He knows his American history frontwards and back! In this book though I felt like he spent way too much time on FDR, Andrew Mellon, and the 16th amendment….repeatedly. I also feel like Cotton should just come out of ‘retirement’….I feel like every book starts with him trying to resume his ‘quite life’ in Denmark and it just doesn’t happen…..ever. So why not be on active duty? I am not sure that his ‘retirement’ is serving any greater purpose. Berry seems to be falling into a kind of ‘formula’ with his books though, which makes me a little nervous….I hate when that happens because then the novels start becoming too regimented and cookie cutter with little plot development. That happened for me in the Sookie Stackhouse books and the Alex Cross books, but I don’t think we are there yet with this series….but I see that some things are following a pattern and if it continues I might think about not continuing the series but as of now, I am content to continue reading it. All that said though there was plenty to enjoy in this book as well. For me, one of the things that I liked best was all the new ‘unknown’ history and historic figures. I spent a lot of time Google-ing the different historic figures and more on the 16th amendment, I felt like I was getting all the dirty secrets from all the different historic conspiracies! Berry is known to have said that his novels are 90% history and 10% speculation…..he definitely delivers on that statement. His historic research is second to none and that is the driving force for me to keep reading his books. You never quite know where he is going to take you next or what bit of history he is going to throw at you. With the first book I read we had English history and the Stuarts, the second book I read had history about the Mormons and Lincoln….every one is different and well researched! It you are into historic thrillers/conspiracies then you really can’t go wrong with the Cotton Malone series. Historic thriller at its finest! Well researched and typically well executed.